A team of researchers from University Paul-Valéry Montpellier and UMR-IMBE, Université d'Avignon has found evidence of possible embalming of severed heads by Iron Age Celts living in southern France. In their paper published in Journal of Archaeological Science, the group describes their study of skull fragments excavated at a dig site near Le Cailar, in southern France, and what their analysis found. The researchers were studying skull fragments uncovered at Le Cailar—to date, over 100 have been found. The skulls are believed to be those of enemy combatants who lost their heads after losing their lives in battle. The fragments have been dated back to the third century BC—a time when the town was a Celtic settlement. The researchers report that many of the skulls had cuts indicating they had been decapitated, and some also had marks suggesting the brains had been removed. In some cases, tongues had also been removed. To learn more about the history of the skulls, the researchers ground up small portions of several specimens into dust, and then subjected the dust to gas chromatography-mass spectrometry testing. They report that they found small amounts of diterpenoic compounds in several of the fragments, which are molecules that are produced when conifer resins break down, typically when heated. They also found evidence of cholesterols and fatty acids. As a control, the researchers performed the same tests on animal skulls that had been dug up at the same dig site—none of them had evidence of conifer resin. 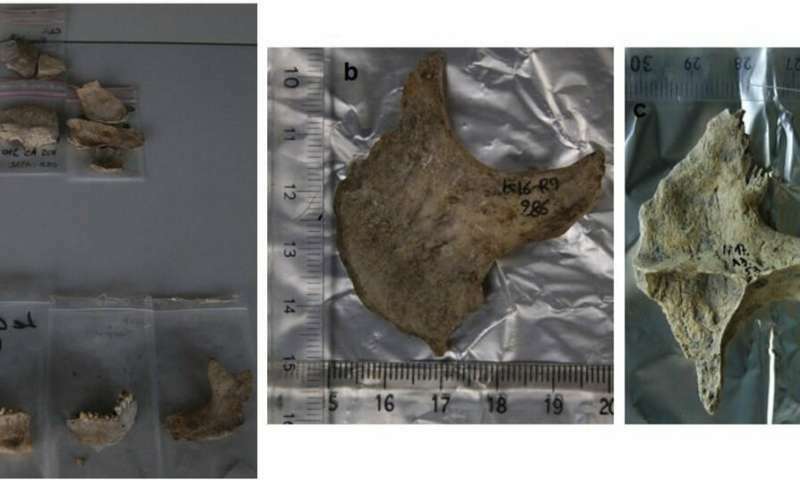 The researchers suggest the resin within the skull fragments resulted from dipping the skulls in a resin-based liquid as a means of slowing decay—a form of embalming. They note also that all of the skull fragments were found inside the walls of the compound, suggesting that the heads had been mounted for those living inside, rather than as a means of frightening would-be attackers. The researchers also report that they have not yet found any evidence that might explain the reason for embalming the heads, but suggest it might have been a means of showing respect to well-known warriors. The hope to learn more as excavation continues at the site. Having the head of a notable enemy to taunt for years must have been high sport for the celts of the time. I would assume it was a chief or someone especially hated to have their skull preserved after being taken in battle.